If you are someone who is single and looking to have fun this weekend with interesting people of your choice, then flirtbox.com.za is the perfect place for you. 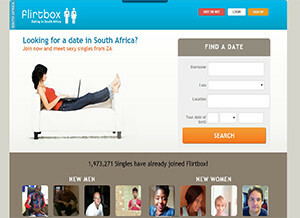 Flirtbox.co.za is an online dating portal for South Africans and interested people from any part of the world. The website has thousands of South Africans who are single and looking for different types of relationships such as flirt, one night stands, fun, romance or even long term relationships such as marriage. You never know the person whom you started chatting for fun might end up as your life partner. What else would a person require from this website? It is entirely free to join and once you are done with that, you are able to make your profile pages with photos, interests & a small bio that describes yourself. There are many members on this site who are single and looking for long term relationships. You can find members according to their locations in different cities of South Africa. The registered members have access to higher details such as zip code, address, phone numbers and more. Member’s gallery provides a good place for having a look at other members and sending them messages on their private inbox. People, who are single and looking for a nice chit chat, really enjoy the online chat rooms and spend quality time there. While in the chat room you may find the “someone special” you have been looking for. You cannot visit anybody’s profile if you are not a registered member of this website and it is absolutely free to become one. There is a nominal monthly fee for those who are looking for serious relationships and want to avail complete services, like sending private messages, having video conversations, and more. Do not go for the membership option if you are really not serious about starting a long term relationship. It has many personality tests & birth zodiac signs, further signaling you the different levels of information for each other. Ease of use: The website is a really dynamic one. The user can navigate through the different pages of the website easily. The newest members keep on showing up on the left side vertical panel. If at any point in time you have trouble with browsing the site, you can surely contact the friendly and professional customer care center of the company that will try their level best to solve your queries. Selection of profiles: The online portal has nearly 1 million profile members from around the world. The South Africans are nearly 37,239 in number. These people vary in interest, age, city, ethnicity & religious beliefs. Star rating: I would rate this site as 3.5/5 having adequate facilities, and members with different and attractive profiles. The discussion area is a good option that makes this website different from the others.